Celebrating women worldwide for their creative expression, this powerful exhibition explored the nearly ten-year history and social impact of this unique international women’s art project. Transforming simple, identical boxes into vessels of artistic and cultural exchange, this retrospective featured nearly 150 of the diverse boxes from more than 36 countries around the world. Ranging from contemporary and abstract content to political and conscious-building messages, these compelling pieces give incredible insight into the lives of our individual communities while breaking down barriers and creating a global movement of women’s voices. Women Beyond Borders is an inspiring, thought-provoking, and aesthetically thrilling project. The connections it has fostered among nations and among women are remarkable. It also becomes a testament to the unbounded possibilities of human creativity, tested here in the seemingly simple transformation of the same small wooden box. Transforming simple, identical boxes into vessels of artistic and cultural exchange, this retrospective features nearly 150 of the diverse boxes from more than 36 countries around the world. Ranging from contemporary and abstract content to political and conscious-building messages, these compelling pieces give incredible insight into the lives of our individual communities while breaking down barriers and creating a global movement of women’s voices. A selection of boxes from extensive adjunct projects, including the Los Angeles School district and Girls Inc. were also represented. 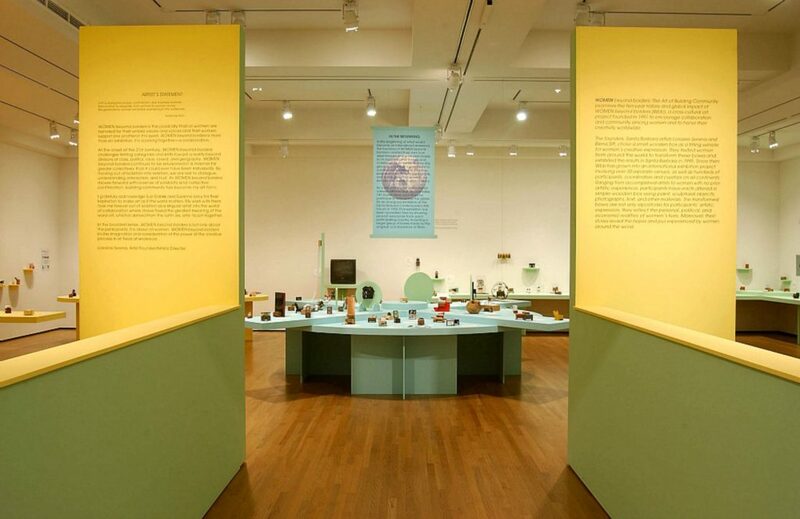 Some of the events that took place during the retrospectives included an International Symposium titled, “ Redrawing the Map/Conversation Beyond Borders”, which was organized by the University Art Museum in Santa Barbara. Keynote speakers included Suzanne Lacy, an artist, educator and writer, who inspired the project WBB from her work in Public Practice. A panel included, Betty Ann Brown, professor of Art History, CSUN; Victoria Vesna, Chair at the Dept. of Design & Media Arts, UCLA School of the Arts; Gloria Alvarez, Chicana poet/intermedia artist in Los Angeles, among others. At the opening in Santa Barbara, the Chancellor of UCSB, Henry T. Yang and his wife Dilling Yang attended the event, which included many cultural ceremonies, dancers and musicians representing all different cultures from around the world. The University Art Museum had over 7,000 viewers with adjunct projects coordinated with the UCSB Multicultural Center, Women’s Center and Girls Inc. of Santa Barbara, as well as the TRIBE Teen Program. The retrospective at Fowler Museum at UCLA also had a successful opening and adjunct projects included ‘Girls Inc./Stepping Out of the Box’ featuring the works of hundred Girls Inc. participants from the greater Los Angeles area. Another adjunct project, titled Youth Beyond Borders, created a city-wide box project featuring 1,000 students from Los Angeles Unified School District. 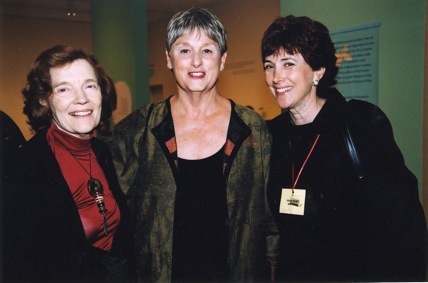 The remarkable trajectory of Women Beyond Borders traces a story of relationships amongst artists, colleagues, women, and friends. The small group of Santa Barbara artists who conceived this international art project in 1991 never could have imagined its subsequent journey and impact. I was lucky to have been one of the individuals who sat around a table in Lorraine Serena’s studio one winter evening to discuss the possibilities and challenges of launching a traveling exhibition that would bring together the work of women artists around the world the decision to build the project around the transformation of a small wooden box led to the initial distribution of 200 boxes to women in 15 countries. 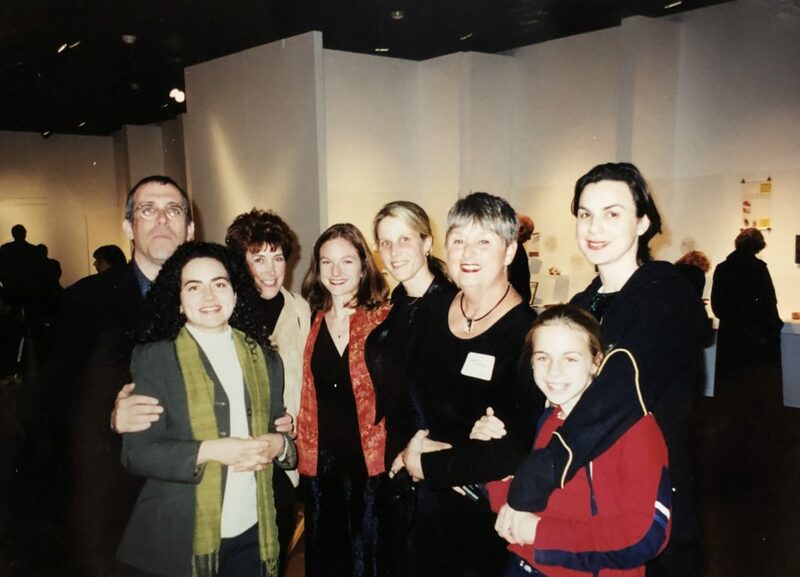 Like the collaborative process underlying the conceptualization of Women Beyond Borders, the inaugural “call for entries” Drew on relationships and contacts that the project founders, Lorraine Serena and Elena Siff, had with curators and Argus abroad. 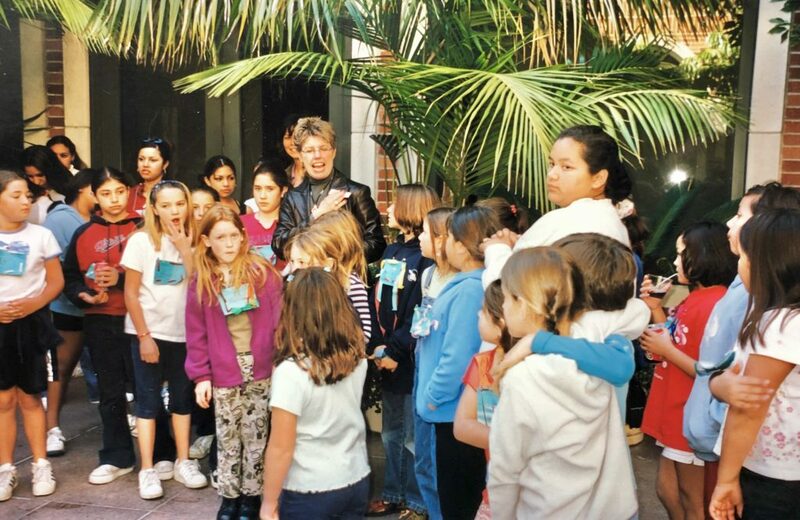 The 185 boxes that came back to Santa Barbara served as the foundation of Women Beyond Borders, which then began it’s travels to virtually every continent in the world. The stunning success of Women Beyond Borders lives in its ability to cross many borders— from local to global, personal to public, singular to collective. 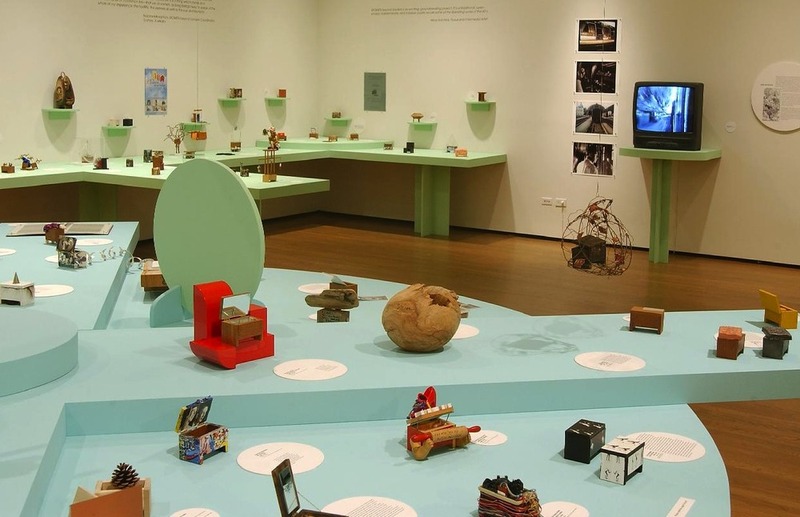 The accumulation of boxes is impressive by virtue of its scale: more than 800 artists have created and contributed boxes that have been exhibited in over 40 unique settings. These contributions attest to the strength of women’s voices and their enthusiastic responses to using a simple box as a vehicle for a highly individual statement. Exhibited together, The boxes are astonishing by virtue of their global reach, ethnic diversity, artistic variety, and expressive range. That’s such a simple object has offered so much to so many is a testament to the foresight of Women Beyond Borders founders. It is clear that Lorraine and Elena have been struck by the willingness of so many women to open their hearts and share their most intimate desires, fears, joys, and sorrows. The project has yielded more than an exhibition of fascinating objects: it has established a worldwide network among women that has surely exceeded all expectations. Women Beyond Borders has made individual creative expression a valued avenue for communication across cultures. While each transformed box is a highly personal statement, the scale of intimacy has permitted many of the participants the safety of bold and even risky messages. Women Beyond Borders has built a global community in which women’s shared, yet individual life experiences have given them common ground. Over the years I have marveled at the remarkable reception of Women Beyond Borders in such far-flung places as Kenya, Singapore, and Russia. 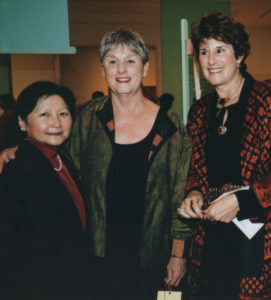 The 10-year retrospective exhibition was organized by the UCLA Fowler Museum of Cultural History and the University Art Museum, University of California, Santa Barbara, in collaboration with Women Beyond Borders. 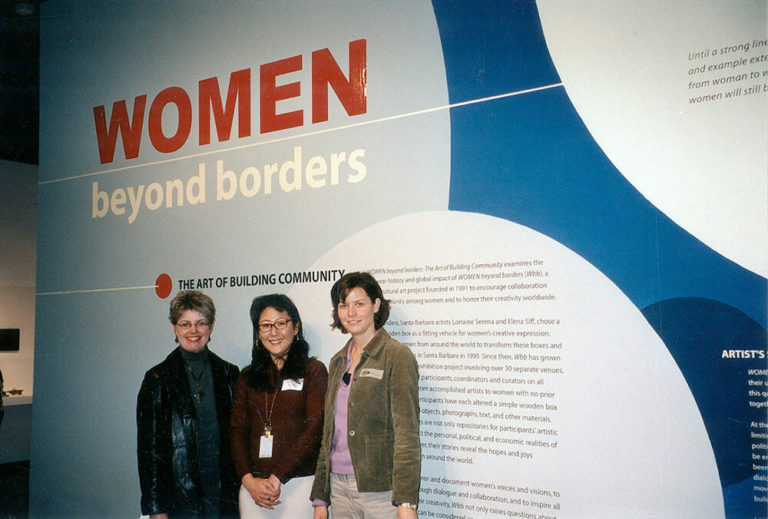 Titled Women Beyond Borders: The Art of Building Community, it served as a document of the world tour representing a selection of boxes from international artists. 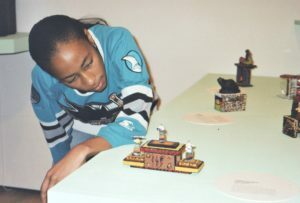 During the exhibition’s run at the Fowler Museum (December 2, 2001-April 21, 2002), it was fascinating to observe the responses of visitors, many of whom were seeing the boxes for the first time. There was always amazement at the sheer variety of artistic solutions and the creativity and ingenuity they reflect. The accompanying texts illuminated the meaning of the boxes and extended their expressive depth, which visitors often found extremely moving and provocative. People picked their favorite boxes and made their selections a focus of conversation. The multiple levels at which the small but compelling works creed function sustained repeated visits, each yielding fresh and affecting experiences. Credit for this extraordinary effort must go promote primarily to Lorraine Serena, who has nurtured it’s growth with a profound personal commitment and the firm belief that such an international art project could make a difference. The hundreds of boxes Lorraine gathered at her studio in Santa Barbara are a tribute to her passion, as well as proof of the powerful forces that are drawn so many women to this unique global enterprise. At one time we thought that the Women Beyond Borders retrospective exhibition would provide a critical look back—but now it has also become the impetus for continuing the path forward. 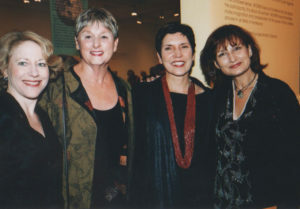 With its mission to honor and document women’s voices and visions, to build community through dialogue and collaboration, and to inspire all women to express their creativity, Women Beyond Borders as an ongoing project not only raises questions about what art is and who can be considered an artist, it continuously challenges national, political, ethnic, religious, and aesthetic boundaries. I made one thousand boxes by pine wood. A thousand shrines, as nests for grist. with just the water in your fist. And their own destinies as well. by airways, brought by winds, by waters’ waves. they returned as rich or poor. Others are open, readings for a night. Today in Santa Barbara it’s raining. A gallery of destinies, of women. . .
s an alive, blessed shawl of hope. and a large pine forest grew up on the earth.